It just makes such beautiful flowers! It's also photopolymer so you can see exactly where you are stamping and you don't even have to use the Stamp-A-Ma-Jig! Hello Honey card stock 5-1/2" x 8-1/2", scored at 4-1/4"
Soft Sky card stock 3-3/4" x5"
Whisper White card stock 3-1/2" x 4-3/4"
This card really is all about the stamping. So I started off by folding the Hello Honey card stock on the score line. Then I took the piece of Whisper White card stock and started stamping my flowers. The largest pink flower was stamped in Regal Rose (which happens to be retired but I didn't realize it). The middle pink flower is Strawberry Slush had the smallest pink flower center is Rose Red. For the blue flowers I stamped the larger one in Soft Sky had the smaller center in Pool Party ink. Next up were the leaves. I stamped them in Old Olive ink and just stamped two leaves before inking up the stamp again. Finally the small flowers were stamped in Daffodil Delight ink. I just love all these bright fun flowers! 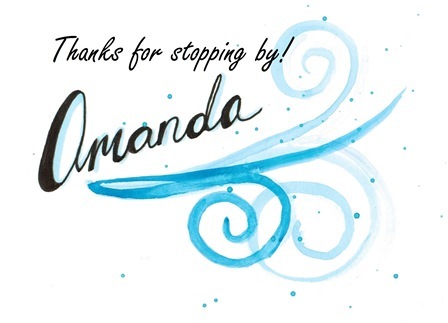 The greeting I stamped onto the bottom of the flower panel in Stazon ink. Finally I glued this layer onto the Soft Sky card stock. 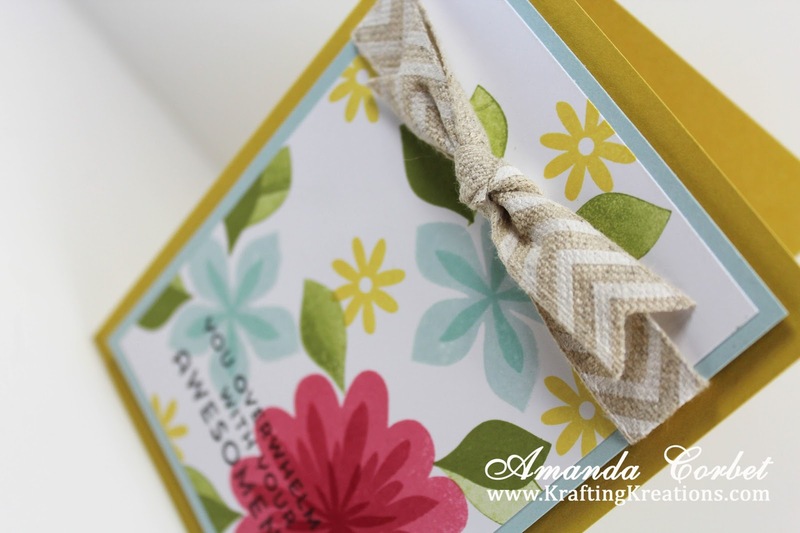 The Natural Chevron Ribbon was wrapped around the top of the panel and tied it into a knot. 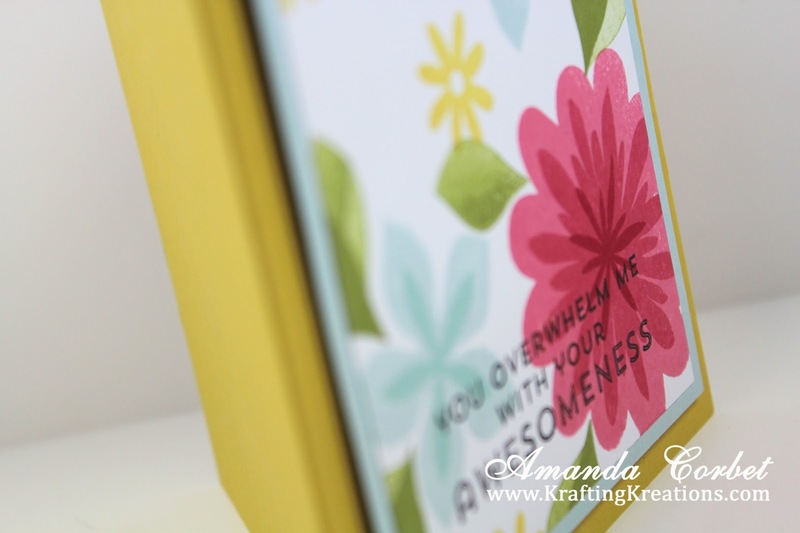 This layer was stuck onto the card front with Stampin' Dimensionals. 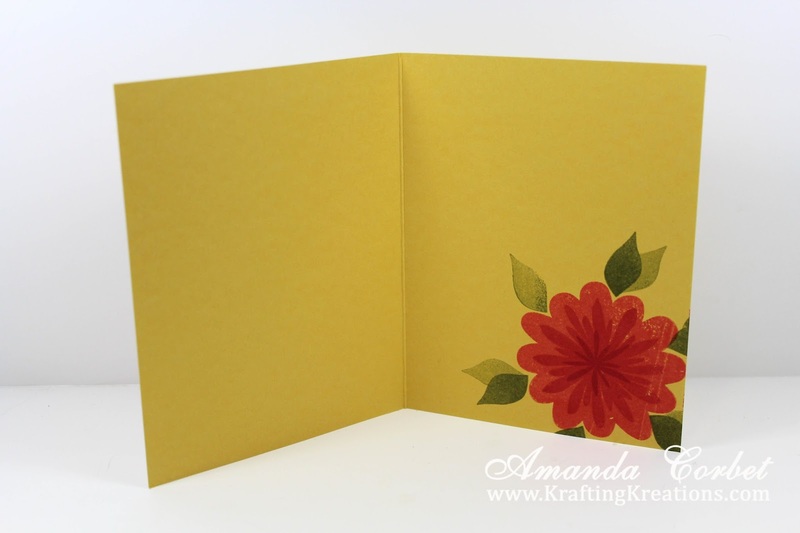 Finally I stamped the same pink flower and leaves inside the card. What do you think of this lovely new stamp set? Summer Party Banner and Card! Secret Gift Box and Card!